Your 3 year-old child has an allergy to peanuts. At a friend's birthday party, she is accidentally given a home-baked cookie. Within minutes, she is struggling for breath. You administer an EpiPen with minimal effect. - Royal Children's Hospital in Melbourne reported 71 intubations in approximately 82,000 visits to their ED in 2013. - The Emergency Department of Cincinnati Children's Hospital found that of 90,000 presentations, only 194 patients received a "critical procedure". In the study, the authors also found that 61% of attendings did not perform a single critical procedure during a 12-month period. Critical illness in paediatrics is a rare and stressful event. Even staff working in busy emergency departments have only occasional exposure. This resuscitation may be the first “real” one they have done for 12 months. The stakes are high. Equipment may be unfamiliar. Straightforward interventions such as intravenous access may be difficult. The presence of distressed family members may be distracting. It is within this error-prone environment that the treating team must safely calculate, dilute and administer medications. Mathematics - even simple multiplication and division - is much more difficult when you are stressed! "Drug dosage errors were found to occur during resuscitation in emergency departments, inpatient settings and out of hospital." "Mistakes are more likely to occur, for example, drug calculations, ten-fold errors, when clinicians operate under heightened conditions of stress, such as during resuscitation." The factors that may lead to drug calculation errors include problems with weight estimation, dosing errors, calculation errors, dilution errors, prescribing and communication errors, administration errors, stress, and fatigue. There are various resources available that ameliorate many of these risks. Some are electronic resources, such as smartphone apps. There are many examples, which include PediCalc, PediStat, PediSafe, PEMSoft, PALS, APLS, etc. Although many of these provide drug dose information, they rarely provide information related to dilution and administration. In addition, it is unusual for all staff in a particular hospital to choose the same apps, and even less common for a hospital pharmacy to endorse a particular product. Although it is reassuring to have information at your fingertips, would it actually be used during a resuscitation? What happens if you are attempting intravenous access or intubation? Do you give your phone to somebody else? The Broselow tape has been available since the 1980s, and provides doses and other suggestions for endotracheal tube and other equipment sizes, however, has little information on medication dilution. Recently, the eBroselow reference tool has been introduced, which provides much more information, and can integrate with other hospital information systems. Our hospital's resuscitation committee has introduced a "Paediatric Emergency Medication Book". It was developed with the input of emergency physicians, pharmacists, anaesthetists, paediatric intensivists, paediatricians, and experienced nursing staff from all relevant areas. Information is provided in a user-friendly, colour-coded layout. 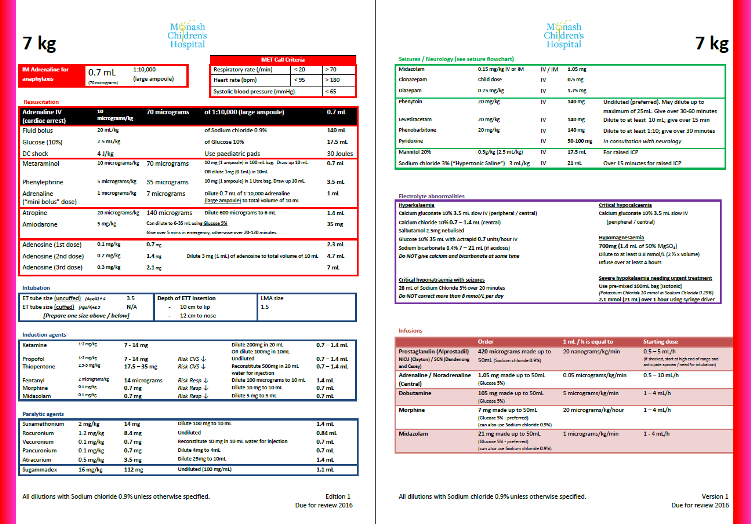 Tables and highlighting provide easy access to medication doses, appropriate dilution, and volumes to be administered. The book has laminated pages, is spiral-bound, and can easily be wiped clean. It is designed for use in clinical settings such as on a resuscitation trolley, in theatre, in the emergency department or intensive care. Our institution has adopted the book throughout all clinical areas that may be faced with paediatric resuscitation. We elected to use a hard-copy rather than electronic copy to ensure availability wherever a resuscitation trolley is located, and to allow for the inevitable spillages of medication and fluids that occur during a busy resuscitation. APLS Australia are planning to incorporate the use of our book in their courses from early 2015. Another example of a similar hard-copy resource is that produced by Cincinnati Children's hospital, the "Pediatric Emergency Dosing Code Book". Whatever resource you choose to utilise, buy-in and engagement from all clinicians involved in the critical care of children is paramount. Ideally, your hospital should agree on a single resource, and all relevant protocols should be adjusted to reflect this. A stressful paediatric resuscitation is not the place for disagreements between staff members about the dose or administration of a potentially life-saving medication. - Paediatric resuscitation is an uncommon, relatively stressful event. - Medication calculations in this environment are a source of avoidable error. - Many resources are available to reduce the risk associated with medication administration to critically ill children. - Hospitals should agree on a single resource to use across all clinical areas.